Tom Stewart has produced some huge numbers to start the year. AFTER earning his first All-Australian blazer and producing a career-best year in 2018, Tom Stewart has managed to elevate his game to yet another level of excellence. In the Cats’ faultless start to the year, the 2018 All-Australian has picked up right up where he left off – and then some. Stewart has built a wall across Geelong’s defensive 50, ranking second in the competition for rebound 50s at a rate of over 10 a game. He has recorded 20 or more kicks in each of the Cats’ three matches in 2019, ranking him number two across the whole competition behind the Giants’ Lachie Whitfield. The third-year Cat has generated plenty of drive out of the defensive 50, generating the ninth most metres of any player in the game. Many would have questioned Stewart’s ability to match last year’s campaign, but after just 46 AFL games he has continued to rise to the occasion. Stewart is averaging close to eight kicks, five rebound 50s, one mark and a tackle more than his maiden All-Australian year. Despite his red-hot start to the year, Stewart is keen to deflect any talk of his own form. “I’m just trying to do as much as I can to help the team out. We’ve got a lot of experienced players down the backline so it’s good to play with them,” Stewart says. The Cat’s team-first attitude is part of what makes him such an integral part of the line-up, as he continues to make strides in his off-field leadership. 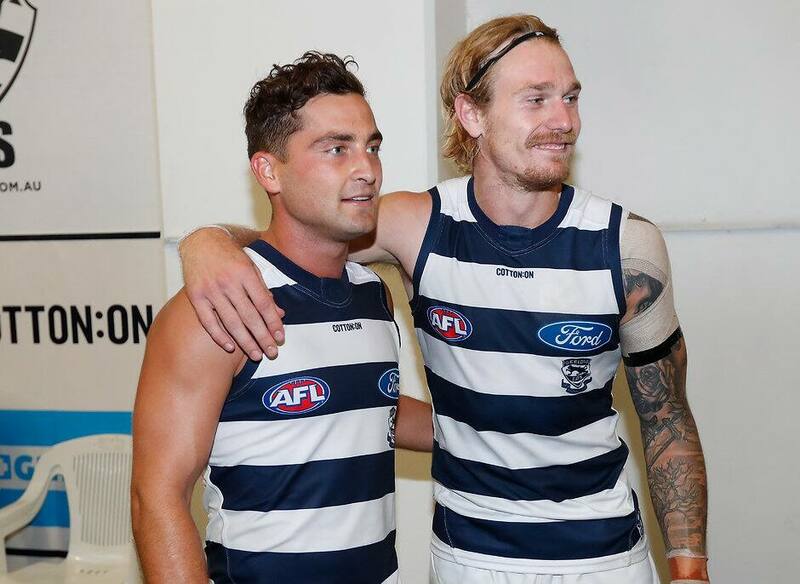 Stewart has become a mentor for young Cat Jordan Clark, showing the young West Australian the ropes as he settles into the club. “The club have set up a mentoring program with the young boys because we’ve got thirteen new players at the club this year. “To have Clarky thrown under the wing has been pretty cruisy. He’s a fantastic kid and he’s really good fun to work with.